Dinosaurs are fascinating creatures that still capture the imagination. They must have been a beautiful sight to see when they were at their pinnacle. Their sheer size and razor-sharp teeth impress children, and people everywhere marvel at their past grandeur, though few can claim to have seen them alive. By now you’ve probably guessed that I’m not really talking about gigantic reptiles. I’m alluding to vehicles like the Chrysler 300C. Sure, some people would point out that there are still a lot of rear-wheel drive sport sedans with big engines out there. But these cars have serious sport aspirations and pump out a lot of power in exchange for archaic fuel consumption. The Chrysler 300C has no sports car aspirations. Although powered by a 5.7-litre V8 Hemi, this engine produces only 363 horsepower and 394 lbs.-ft. of torque, which is not enough to rival a BMW M3. But it’s not just a question of power. The Chrysler 300C is big, awkward, has poor visibility for a car of this size and lugs an enormous weight around. In other words, it’s like a throwback to 40 years ago, when big rear-wheel drive cars with big engines were rampant. While I’d like to think that we’ve progressed since then, some people still cling to this type of car. In fact, in a totally unscientific survey we did on our Facebook page, our readers were clear that they like the Chrysler 300, and they like its Hemi version even more. And after a week at the wheel of this likeable car, I understand why. As I was saying in the introduction, the Chrysler 300 is enormous, regardless of the version you choose, but that isn’t always a bad thing. For example, so comfortable are the back seats that some passengers told me that they had never been so comfortable in a car. I wouldn’t go quite that far, but the Chrysler 300 is indeed very cushy. And the same thing applies on the road: comfort fit for a king, especially on the highway, though the seats don’t have much in the way of lateral support, just like back in the day. The 300C Platinum comes with real leather and wood trim. My car’s metallic blue paint was the perfect complement to the white perforated leather. Even the steering wheel comes in leather. Normally, I’m not a fan of wood in a car, but this time, it’s tasteful. The instrument layout is good. You often hear in the media that the 300 has one of the nicest interiors in the industry, and I tend to agree. Driver and passenger infotainment is provided by Chrysler’s Uconnect system. It’s proven and isn’t hard to use. The GPS navigation can be difficult to program, but you get used to it pretty quickly. However, visibility isn’t very good in the 300. Compared to other big cars, like the Acura RLX, you don’t see the front of the vehicle well either. If you want to order something at a drive through, you’ll need to be supremely confident in your ability to judge distances. The rear window isn’t very big and the blind spots are difficult to check. Fortunately, the 300C Platinum comes with a gamut of radars to guide you in a world full of obstacles. V8 engines are becoming less and less popular – even BMW uses a six-cylinder turbo in its M3. For 2015, you won’t be able to get an SRT version of the Chrysler 300 with the 6.4-litre V8 Hemi. Furthermore, all-wheel drive isn’t available with the 5.7-litre V8 anymore, so if you want the “big” engine, you’ll have to deal with a less functional car year-round. Then again, our parents all drove rear-wheel drives in the snow. So here we are before the world’s most powerful Chrysler. 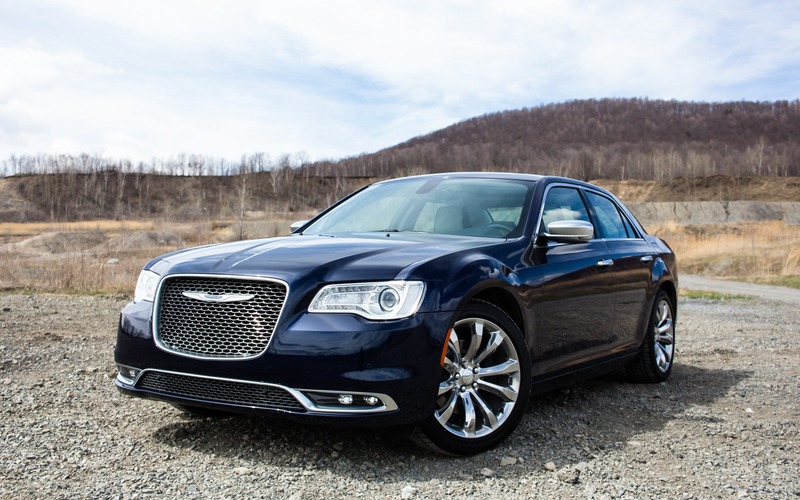 In the 2015 Chrysler 300C, the Hemi V8 develops 363 horsepower at 5,200 rpm and 394 lbs.-ft. of torque at 4,200 rpm. It comes with an eight-speed automatic transmission, and gets from 0-100 km/h in 5.3 seconds and from 0-160 km/h in 12.3 seconds. These performance numbers aren't bad, but they aren't astounding either. Once again, the 300C doesn’t aspire to be a sports car. That said, the transmission can be put in Sport mode for delayed gear shifting and the engine can also change modes for quicker reactions. Braking is more aggressive than in the inferior versions thanks to its bigger brakes. Overall, the current generation’s handling is much better than in the past. Even the fuel consumption isn’t that bad. Thanks to the cylinder deactivation system, it drives like a V4 on the highway. I recorded a combined fuel consumption of 12 L/100 km, which isn’t bad for a V8 engine, but the 7.7 L/100 km on the highway promised by the manufacturer is a bit optimistic. The feel of the car, despite its improved handling, isn’t especially exciting. What’s more, on bad roads, the Chrysler 300C bounces a lot in front, a little like a pick-up. The good news is that this doesn’t happen in the V6 version, which makes me think that the engine mounts used in the vehicle could be improved. Cars are charged with emotion. If they were just to get you from A to B, before long we’d all be driving around in Trabants. The 300C proves that emotion trumps reason. It isn’t the most rational car in the industry, and in a world where everything is shrinking, there’s no place for a big rear-wheel drive sedan powered by a V8. Then again, you could survive by eating vitamins and bread, but who wants to live without flavour? The 2015 300C packs plenty of flavour. Unique flavours, yes, but flavours that make life exciting. 7/10	Good fuel consumption for the size of the engine. 8/10	Super comfortable car, but strange feel in the front on bad surfaces. 8/10	In the large sedan segment, the 300C holds its own. 8/10	Uconnect is efficient and easy to use. 7/10	The car isn’t particularly exciting to drive, but it isn’t boring either. 8/10	The 300C Platinum offers a lot of flavour and is full of charm overall.